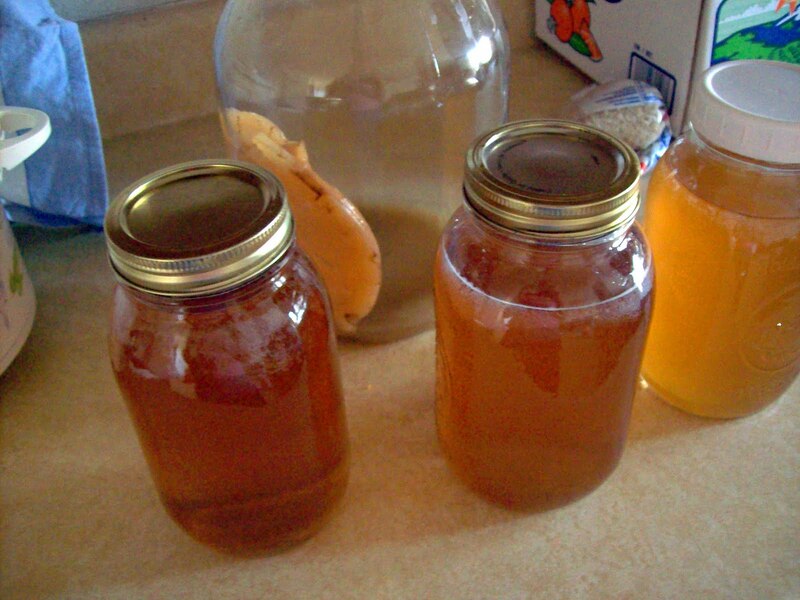 Home » drinks » traditional food » Fermented Sweet Tea- Kombucha! Kombucha- also known as SCOBY, Mother, Baby, Mushroom, Tea Beast- it all is on the weird side of traditional foods, but is interesting nonetheless! I finally made my first kombucha last month. I followed Briana's directions of making a strong tea, adding sugar (yes, refined sugar is called for in this Nourishing Traditions recipe! ), the mushroom, and letting it ferment at room temperature for a week. I got my mushroom from a friend, but they are available to buy from Cultures for Health. Picture is my first batch of kombucha ready to go in the fridge, and the mother (mushroom) still in the glass jar waiting to be re-filled with sweet tea to ferment again. My first batch didn't produce a baby, but I asked about it on Facebook and it's most likely because I had the mother refrigerated prior to use. Now if I need to set the mushroom aside between uses I cover with some kombucha and keep in a mason jar covered with a cloth napkin on my counter. While it was fermenting, I looked for more information on this little concoction. Interesting stuff! The Kombucha mushroom is not really a mushroom, or even related to mushrooms, in reality it is a symbiotic relationship between a number of bacteria (beneficial) and special yeast cultures. The symbiotic nature of the bacteria and yeast ferments sweetened tea to become kombucha tea, a refreshing, naturally carbonated beverage used for over two thousand years as a refreshing beverage as well as a beneficial tonic. Kombucha is a culture, so it's full of probiotics like lactofermented veggies and yogurt. It's a little bit of an acquired taste, but once you are hooked it's a wonderful natural substitute for soda. The culturing process brings out more nutrients from the tea. Kombucha is said to help CFS and EBV, detoxify the liver, prevent acid reflux, be helpful to reduce alcohol cravings for recovering alcoholics (see below for precautions with that), provide B vitamins, and more (you can read a lot of incidental findings on Earth Clinic). What to watch for when making kombucha: Watch for fuzzy mold to develop- if it does, throw it out. I seem to have really good results with my ferments/cultures and have never had to throw anything out, so I think this would be pretty rare. Potential Side Effects: Kombucha can be detoxifying, and just like strong probiotics, coconut oil, or epsom salts, it's best to start slow to see how you react to the detoxifying properties. I tried just half a glass at first, and it didn't bother me. If you have liver issues/hepatitis, do your own research, there is some controversy with whether kombucha helps or harms in regards to hepatitis. Alcohol content: It has a low alcohol content. This seems to be controversial, but I feel like I've had a bit of alcohol it when I drink a large glass. I normally don't drink, so I'm more sensitive than most people would be. Personally, I avoid alcohol because I have no desire to experience it's affects, and I think I can avoid that by drinking (ahem) less than a quart of kombucha at a time. For children it's recommended to water it down. Kombucha is sold in health food stores, and doesn't require you be over 21 or older to buy (I think here you have to be 21 to buy nonalcoholic beer even!) so it must be pretty low content. It's good to keep in mind anyway. Food Renegade tells how to make a scoby from store bought kombucha. Hartke Is Online has a post about making kombucha from apple juice rather than tea. GNOWFGLINS uses honey or unrefined sugar in hers, and answers a lot of questions in her post. Is Kombucha something you're already doing? Something you'd like to try? 0 Response to "Fermented Sweet Tea- Kombucha!"